From the general advice on the kind of attitude with which to rely upon the spiritual teacher according to the Lamrim Chenmo, there are nine points, or nine ways in which to devote yourself to the spiritual teacher. The first of these nine points is the instruction to abandon your sense of independence and develop a sense of reliance or devotion toward your spiritual teacher that is like an obedient son or daughter. You should have the mental attitude that allows your spiritual teacher to guide you without resistance. Being obedient here means making sure that the way in which you think and the way in which you act are harmonious with the wish of the spiritual teacher. Sometimes the teacher will give you certain advice as to what to do or what not to do. Even if from your point of view that particular advice does not appear appropriate or does not seem to fulfill the necessity of the situation, for the sake of being able to train your mind in the practice of pure devotion, you should be able to give up your interest and follow that advice. 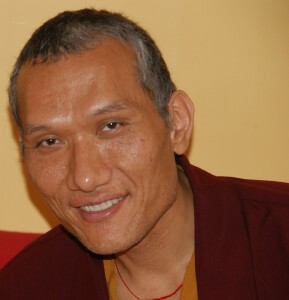 Many of the disciples who serve Lama Zopa Rinpoche can be considered as examples of disciples who give up independence and freedom like an obedient child. When you serve Rinpoche, you give up your interest in sleep. You give up your interest in food. And you give up your interest in time for yourself. If you want to serve Rinpoche, you have to be able to give up all these things.